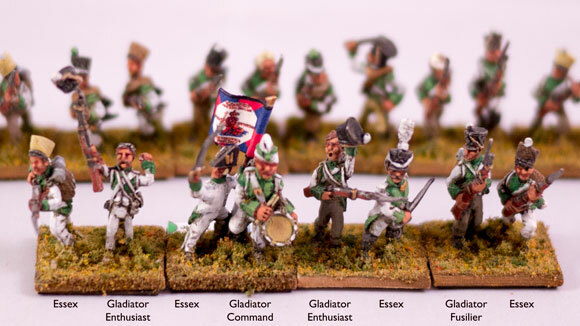 I have been painting 15 mm figures for the 1809 Austro-French campaign. One of the contingents in my collection is the Dutch force that fought with the French. I used Essex and Gladiator (nowadays sold by Black Hat) French figures for the infantry brigade, as good figures were not readily available, Minifigs was probably the only manufacturer making them at the time. The major faux-pas with these figures is the lack of the orange side-plume in the shako. Well, the end result is good-enough-for-gaming in my opinion. The figures mix fairly well, apart from the Gladiator command figures. For some reason there are two distinct styles in the Gladiator range – the stocky figures you’d expect from them in the command pack, and the weedy fellows in the fusilier and enthusiastic infantry ranges. Clearly two different sculptors have been at work here. Genever-fuelled Dutchmen advance with great courage and élan!